What Does Hillary Clinton Think About My Blog? Last night the State Department released around 3000 of Hillary Clinton’s private emails to its website. To my great surprise, one short email exchange was concerning this blog (thanks to James West at Mother Jones for bringing it to my attention). The topic was a blog post that I’d written on the diplomatic fiasco that the U.S. pavilion for Expo 2010 (a.k.a the Shanghai World’s Fair) was then becoming. The people State had chosen to design, build and run it were becoming major liabilities, and I’d been very critical, both on this blog and in the U.S. media (especially at the Atlantic). On July 11, 2009, I wrote this blog post. 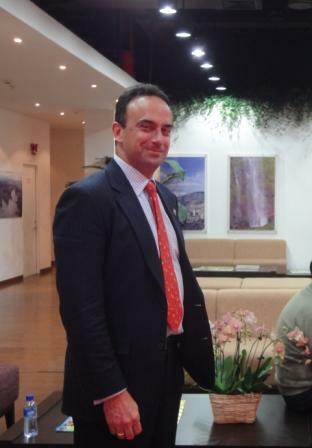 Not long after, Thomas Cooney, a U.S. Consular Official in Shanghai forwarded the post to several people, including Jose Villarreal, the U.S. pavilion’s commissioner-general, who forwarded it to Cheryl Mills, then Clinton’s Counselor and Chief of Staff, who in turn forwarded it to Clinton herself. Clinton then responded to Mills. What did Clinton say? Clinton’s only email in the exchange – issued yesterday – is below. Readers will note that her comments – whatever they might be – were redacted, scrubbed! This is a grave disappointment. After all, it’s not every day that I get feedback on my blogging from a Secretary of State (even if that feedback is six years old). What happened? Did my simple post set off a profane rage in the Secretary? 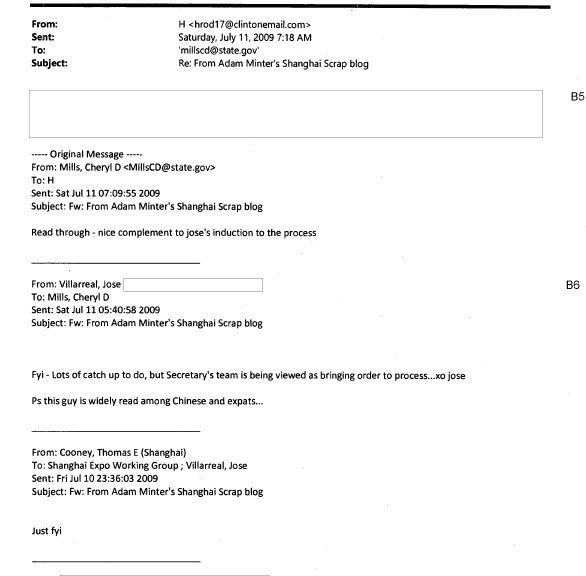 Or perhaps someone at the State Department simply doesn’t want the world to know that Hillary Clinton was/is a Shanghai Scrap fan. Whatever the truth, I’d like to know it. So right here, right now, I’m ready to make an offer. If you have access to the original email, I’m willing to exchange a hardcover copy of Junkyard Planet: Travels in the Billion Dollar Trash Trade, for an off-the-record look at it. But wait! If you’re willing to go on the record, I’ll not only give you a copy of Junkyard Planet: Travels in the Billion Dollar Trash Trade, I’ll sweeten the deal by throwing in a case of the American-brewed beer of your choice. Reach me via the Shanghai Scrap contact form; confidentiality assured. I finally had a chance to visit the ongoing demolition of the Expo 2010 [Shanghai World’s Fair] grounds this afternoon. Much of what I saw is destined for publication somewhere other than Shanghai Scrap. 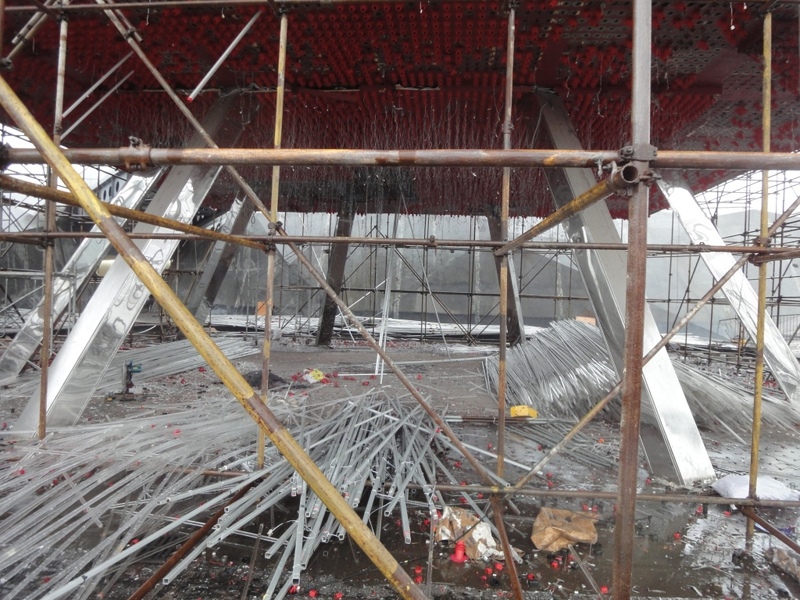 But I’d be remiss in my duties as a blogger if I didn’t post the striking state of the (once) iconic UK pavilion, now stripped, denuded, humiliated – just another Shanghai demolition, in-progress. Those signature lucite branches that used to sway in the breeze? You’ll find them cracked and broken on the ground – and at the front of the photo (for detail beneath the pavilion, click here). For reference sake, a nighttime image taken a few months ago, during happier times (for the beleaguered pavilion), from roughly the same spot. Alas, all good things must end (and, for the record, I thought the UK pavilion was a very good thing, indeed). 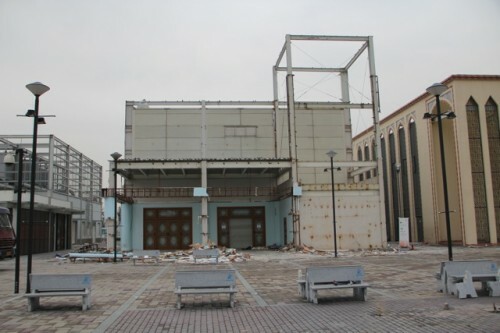 My patriotic British friends will surely be proud to know that the demolition of their pavilion appears to be much further along than the demolition of most other Western European pavilions. Rule, Britannia! 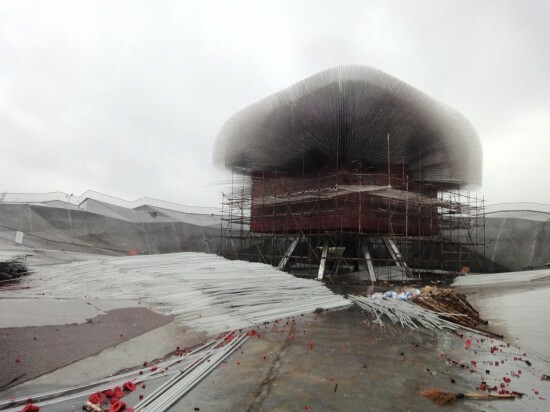 Some post-Expo transparency shall shine on the USA’s inexplicable pavilion secrecy. 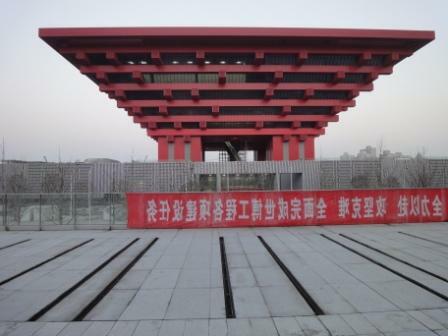 Please note that the organization – officially Shanghai Expo 2010, Inc [SE2010] – was commissioned by the US State Department to design, build, fund, and operate a USA pavilion at Expo 2010. If the State Department itself had done it, the governing documents, conflict of interest policy, and financial statements would have been – by law – available to the public. But, for reasons I won’t go into here, it wasn’t run by State. In any case, the State Department, the Beijing Embassy, and the Shanghai Consulate apparently saw nothing objectionable in hiding from the American people, how money, raised and spent in their name, was being spent. This is precisely the kind of secrecy – totally unnecessary, over-the-top secrecy – that makes organizations like wikileaks so valuable and necessary. So, in that spirit, I’m going to make available for upload/viewing SE2010’s Form 990s from 2008 and 2009. Right-click them to download; otherwise left-click and they’ll appear in a form you can read them at Shanghai Scrap. I should be clear: there’s nothing confidential or secret here. These are publicly available documents – a person just has to go through the trouble of getting them. So consider this post my gift to Shanghai Scrap’s readers: you no longer have to go through the expense and trouble of getting them. Now, a warning: there’s no obvious smoking gun here. These documents span a period that ends in late summer 2009 – before most of the money associated with the pavilion had been raised and spent. Still, there are a couple of item that stick out, the most glaring being the US$367,830 on legal in 2009 (Part IX, line 9b). Ellen Eliasoph, a co-founder and director of the pavilion, is also a partner at Covington & Burling – the official legal services provider for the USA pavilion. In other words, as a partner in Covington & Burling, she personally benefited from the money spent on those legal services – which may be one reason that SE2010 didn’t want its conflict-of-interest policies and financials made public. But whatever. Have a look for yourself, let me know if you see anything, and I’ll be back at you with what promises to be a much more interesting batch of 2010 tax filings whenever they become available next year. 8 Hours at the World’s Largest [Fastest?] Demolition Site. 4:00 p.m. — NORTH KOREA HAS DISAPPEARED! After five hours wandering around the site, I had to admit that I was disappointed. The Expo was over, I complained to my friend. So far, I had mostly seen piles of scrap metal, a few uprooted benches, some beaten walls. I wanted to see actual demolition. At the very least, I wanted to see a pavilion so stripped that it was unidentifiable. 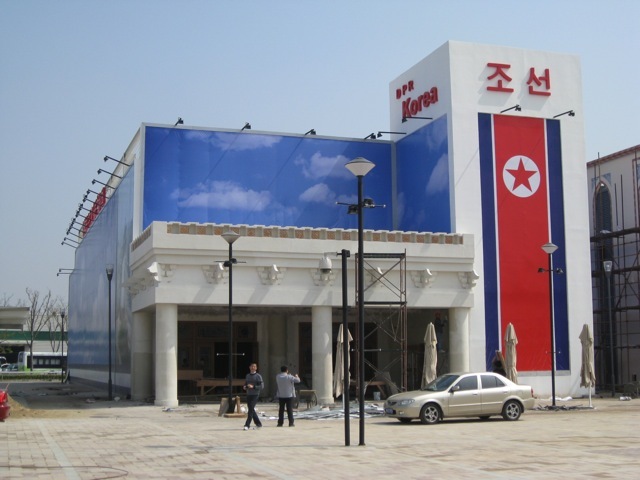 North Korea really knows how to strip a pavilion bare. 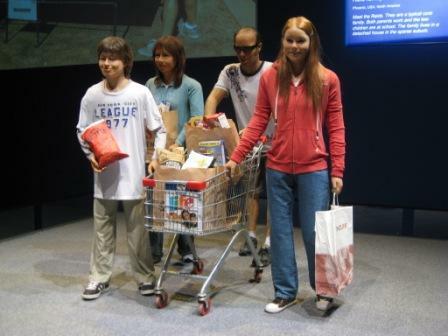 As far as I could tell, it is the only country that chose not to linger at the Expo. 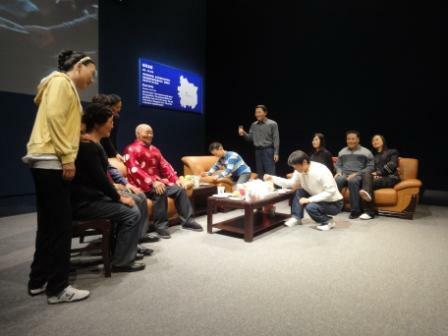 The personal and professional interests of the foreign media in China have never had much in common with the average Chinese people with whom they cover. Sometimes, this is a good and necessary thing: if the foreign media won’t cover Chinese dissidents, who will? But often, this produces absurd results that distort – for readers and viewers outside of China – what matters to China. Take, for example, the near obsession that China’s foreign correspondents have with Jia Zhangke, a very good Chinese filmmaker who makes “serious,” socially conscious films that have almost no audience in China, but which win awards abroad. This year, during the Expo, the New Yorker (to choose just one English language publication) devoted thousands of words to Mr. Jia. Fair enough, I suppose, except for the fact that – at the same time Jia Zhangke was appealing to a decidedly small audience of hyper-educated New Yorker writers, readers, and editors, the turnstiles at Expo 2010 – the Shanghai World’s Fair – were rotating at a rate that eclipsed Jia Zhangke’s entire Chinese audience by noon, every day, May to October. 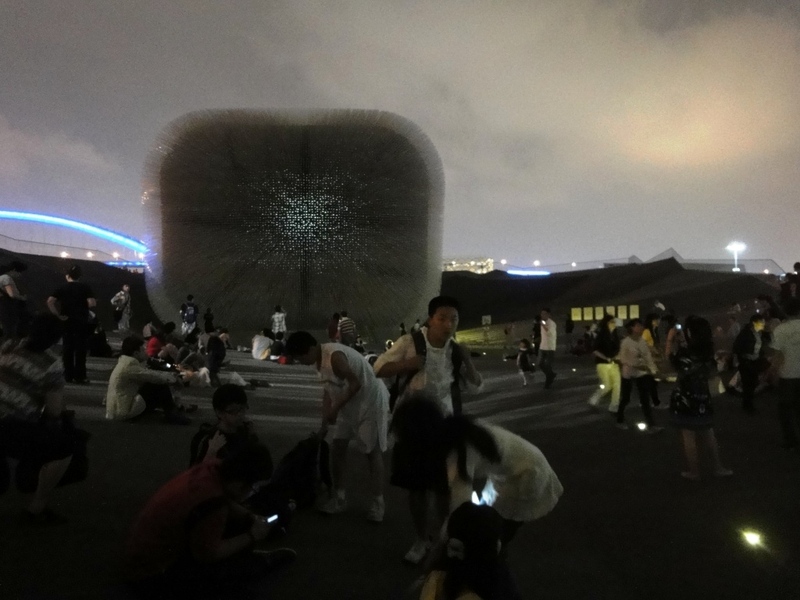 If New Yorker readers wanted to know something about why people were rushing through those turnstiles, they’d have to look elsewhere because, aside from a few blog posts, the magazine published nothing on Expo 2010 – the biggest and most expensive event that ever took place in China (and, some argue, anywhere). Of course, the New Yorker, and its terrific China correspondent weren’t along in this choice of coverage – they were joined in the decision by most of the China-based foreign media (and their overseas editors). What a pity.